The remarkable journey of a multimillion-dollar plan to remove plastic from the Pacific began with a teenager's TEDx talk. In 2012, 18-year-old Boyan Slat proposed an invention to collect garbage from the ocean's surface. His talk went viral. Slat dropped out of Delft University of Technology and founded the Ocean Cleanup, a Dutch nonprofit organization trying to build a flotilla of sea-sweepers. By 2017, the Ocean Cleanup had raised $31.5 million, which included contributions from billionaire venture capitalist Peter Thiel and philanthropists Marc Benioff and Lynne Benioff. Rougher waters lay ahead. The organization's first garbage collector, a 2,000-foot buoy-and-skirt invention nicknamed Wilson, broke in two. On December 29, the Ocean Cleanup discovered a 60-foot section had snapped free. Worse, during its initial four months at sea, Wilson failed to collect any trash in a trash-rich region known as the Great Pacific Garbage Patch. A tug boat towed it toward Hawaii's Hilo Bay, where the contraption was anchored on Thursday. Scientists unaffiliated with the project are skeptical that this system, or future iterations, will work as intended. Kim Martini, an oceanographer and science communicator, and Miriam Goldstein, director of ocean policy at the Center for American Progress, independently reviewed the Ocean Cleanup's feasibility study in 2014 and found it wanting. "When the feasibility study came out, the press was really excited about this," Martini said. "But a lot of scientists had been saying, 'Well, you know, this is really hard and probably not going to happen.'" Since the 2014 review, the buoy-and-skirt design changed, becoming smaller and omitting a deep-sea anchor system. But Martini and Goldstein said their assessment remains the same: The Ocean Cleanup's goals are laudable. Its design is not feasible. During a live video chat in 2014, Nicholas Mallos, an expert in marine debris at the Ocean Conservancy, asked Slat about Martini and Goldstein's concerns. Slat replied that the women were not engineers. "And that," said Goldstein, who wrote her dissertation on the ecological impacts of plastic in the garbage patch, "is the only response we ever got." Earlier this month, Clark Richards, a physical oceanographer at the Bedford Institute of Oceanography in Nova Scotia, pointed out the possible physics flaws in Wilson's design. Slat, on Twitter, thanked Richards soon after the oceanographer posted his critique. Goldstein said "it was a bit puzzling as to why Clark got an immediate polite response" but the two women did not, nor did Rebecca Helm, a jellyfish expert at the University of North Carolina at Asheville who also has raised concerns about the project. Martini said she was disappointed, but not surprised, by Wilson's recent stint at sea. The oceanographer said she hoped the project would prove her wrong. "The reality is that I do care about the ocean. I want things to change," she said. "And so do a lot of the people that work there." Slat, in his TEDx talk, described the modern era as the Plastic Age. Humans have produced about 8,300 million metric tons of plastic since its invention. Approximately 8 million metric tons of plastic waste enters the ocean in a year, according to a 2015 estimate. "That's roughly equivalent to a New York City garbage truck full of plastic being dumped into the ocean every minute of every day for an entire year," Mallos told The Post. By 2050, oceanic plastic will outweigh the collective bulk of the world's marine fish, the World Economic Forum predicted. Some of this plastic gets concentrated, thanks to a circular current called a gyre, in a region known as the Great Pacific Garbage Patch. Plastic particles, many the size of a pinkie fingernail or less, swirl through the water there. "If you drag a fine net through the water you get what is, essentially, plastic confetti," Goldstein said. "There's just tiny little fragments for thousands of miles." Richards was not shocked that a large, first-of-its-kind structure broke after a few months at sea. He offered a maritime maxim: "Anything that can go wrong will go wrong, and anything that's not supposed to break will," he said. Given the harshness of the ocean environment, "we tend to build things as small and minimal as possible." 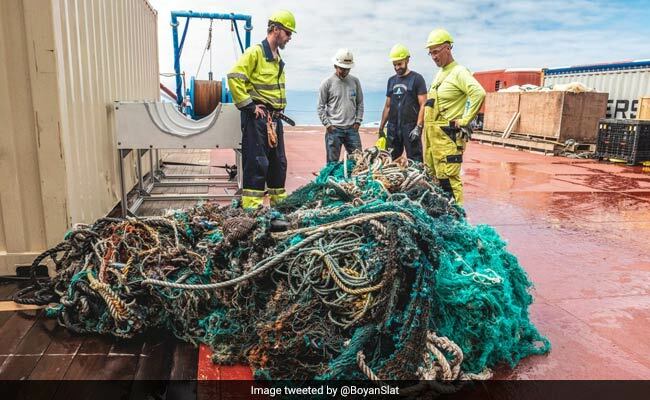 "Our working hypothesis is that material fatigue, caused by about 1.5 million load cycles, combined with a local stress concentration" led to a fracture, said Jan van Ewijk, a representative for the Ocean Cleanup. Despite the setback, the organization aims to deploy 60 buoys in the coming years that it claims could shrink the Great Pacific Garbage Patch by 90 percent by 2040. "We are not ending the program. 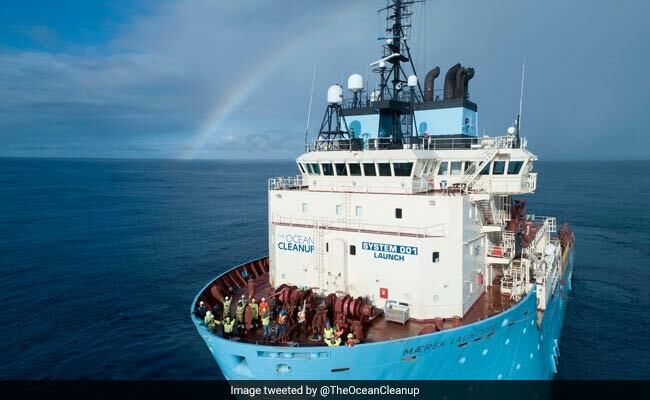 Wilson will be repaired, modified and brought back to the Great Pacific Garbage Patch as soon as possible," van Ewijk said. Although Wilson was too sluggish in its first test, "most aspects of concept have been confirmed," including the ability to intercept plastic, Slat tweeted on Dec. 11. "It's just not moving fast enough yet," he wrote. "This is fixable." The Ocean Cleanup may be relying on simplified physics that do not account for small-scale currents, Richards wrote on his blog on Jan. 6. Zoomed way out, the Pacific gyre rotates predictably, like the swirl of a giant toilet. But, close up, the region is a jumble of very tiny eddies that Richards described as "squirts" and "jets." A complex dance of waves, wind and current plays out at the ocean's surface, he said. That dance may not propel the system as fast as it needs to go. The Ocean Cleanup also says marine life can swim beneath the device unharmed. Goldstein, however, pointed out that organisms called neuston, which include jellyfish and snails, live only on the ocean surface and cannot dive. She was not concerned about a single device. But, if Ocean Cleanup deployed 60 giant floaters, "they would necessarily take all the neuston out with all of their trash," she said. "There's really no way around it." Goldstein, Martini and Mallos offered several alternatives to high-seas garbage collectors. "There is no silver bullet, and we have to attack it from all angles," Goldstein said. She advocated for stopping waste sooner - preventing trash from leaving the coasts - before devoting resources to the plastic waste far from shore. "Legislation is really the way to go," Martini said, to "make people responsible and companies responsible for the amount of plastic they're producing." Mallos recommended beach cleanups, like the International Coastal Cleanup run by the Ocean Conservancy. These volunteer efforts have prevented nearly 300 million pounds of trash from escaping into the ocean, he said. "That's an exorbitant amount of debris that did not require us to go out to the middle of the ocean to have an impact."